Arnott and Vederoff Ancestors - The foot stone at the grave of Andrew Jackson King, Kings Ferry, Nassau County, Florida. Photo taken November 2008. 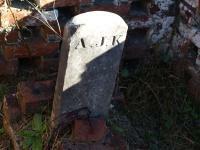 The foot stone at the grave of Andrew Jackson King, Kings Ferry, Nassau County, Florida. Photo taken November 2008.